At an annual church business meeting one way to get an extra hour from parishioners is to bribe them with a free lunch. Given the noonish time of day, we do brunch. We try for a one-size-suits-all sort of dish that isn’t too costly, can be made ahead and will be easy to serve. 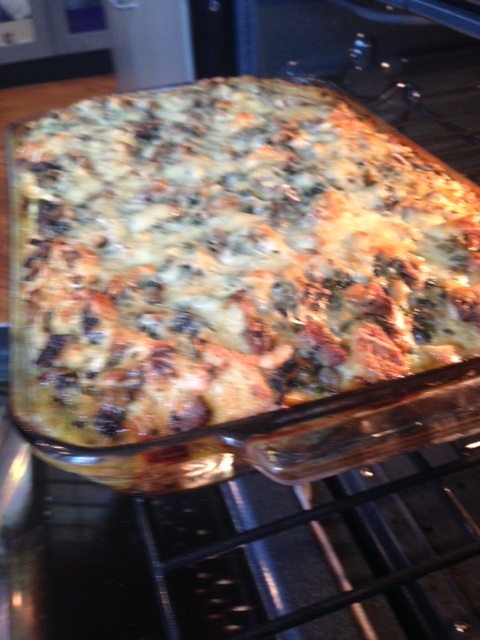 This year we opted for the old standby Strata updated into a savory bread pudding. Here we have bread, sausages, cheese, vegetables well seasoned, layered in buttered Pyrex bakers and moistened with creamyegg-and-milk custard. Wrapped and stowed in the big fridge, Strata for 70 waits for its morning call. With a couple of people minding ovens during the service, the baking Strata fills the church with a inviting aroma. 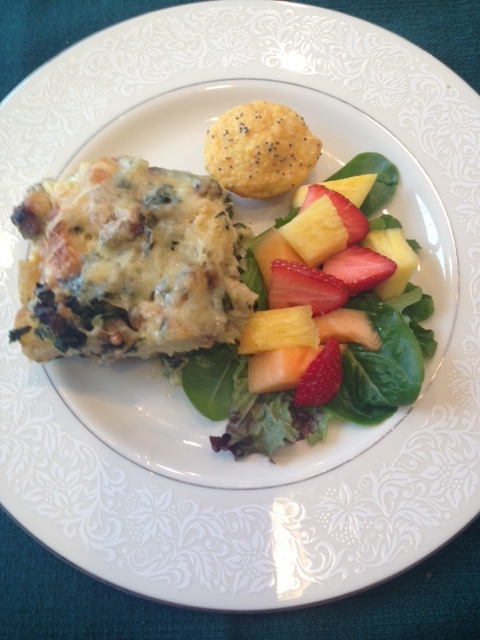 Accompanied by mini-muffins, fresh fruit and salad greens, the Strata will be a tasty reward. Popularized by the Silver Palate cookbooks in the 1970s, Strata gets its name from ingredients layered into a baking dish. No doubt the idea grew from older American recipes such as “Luncheon Cheese Dish” or “Cheese Sandwich Casserole” of the 50s that I remember served to a party of fourth grade girls. As always the success of a casserole depends on the quality of its contents. The number- one player here is bread. Be sure to use a sugar-free French loaf or an artisan sourdough. Avoid processed cheeses. I recommend a mixture of Swiss and white Cheddar, but any mixture of good grating and melting cheeses will be fine. Sausages, from bland to spicy, may be combined with diced smoked ham or turkey. For a vegetarian version, omit the meat products and add extra vegetables. Mushrooms, spinach (frozen is OK here), onions, roasted red peppers, chopped sun dried tomatoes, even cooked kale will be welcome in a Strata. One solution to the morning cooking scramble: layer in the Strata a day beforehand and produce a dazzling dish from a clean kitchen the next a.m.
Cut the bread into large dice. Include crusts unless scorched. Measures about 9 cups. Melt butter in small heavy, sauté pan and sweat onion over low heat. Add chopped garlic to the top of the onion and cover with butter wrappers or a parchment circle. The onion and garlic should not brown but will lightly color, melt into softness and reduce by half. Allow 20-30 minutes to cook the onion. Combine the cooked onion, garlic, drained and squeezed spinach, sautéed mushrooms, cooked sausage, parsley and thyme. Season the mixture with salt and pepper. The vegetable/sausage mixture should weigh around 2 ½ lbs. Beat the eggs in a large bowl; add cream, milk and season well with salt, pepper, freshly grated nutmeg and a pinch of cayenne. Generously butter a 3 1/2-quart shallow casserole or baking dish. Add diced bread to the egg and milk mixture. Lift half of the moistened bread with a slotted spoon and spread it over the bottom of the baking dish. Distribute 2/3 of the vegetable mix over the bread and top with 2/3 of the grated cheese. Add the second half of the moistened bread over the vegetables and sausage. Pat everything firmly in place with your clean hands. Pour the remaining milk and egg mixture evenly over the casserole and sprinkle over the remaining cheese. Cover with plastic wrap and refrigerate overnight. Remove from fridge an hour before cooking if possible. Bake Strata in a 375° oven for 45-60 minutes or until puffed and golden. Allow to rest at room temperature 15 minutes before cutting. Serves 8-10. To increase the Strata recipe for 15-18, using a 5 L baking dish, extend the basic recipe by 1/3. For example: 12 oz. bread should become 16 oz. bread, etc. You are currently browsing the Mary Jo's Kitchen blog archives for January, 2016.